I hope y'all had a great Independence Day and enjoyed the fireworks. We went out to eat Chinese and I was looking forward to that delicious coconut shrimp, drenched in an equally delicious sauce, they serve at their buffet. Well, guess what? They were out of coconut shrimp, argh. That did not stop me and certainly did not diminish my appetite though; there was so much more to choose from which appealed to my taste buds. It made me curious about all the supplements, vitamins and nutrients a coconut would provide and since inquiring minds want to know, I did a search. Coconut is the fruit of the coconut palm. Roughly oval, the fruit has several layers: a smooth outer covering; a fibrous husk; a hard, brittle, dark-brown, hairy shell with three indented "eyes" at one end; a thin brown skin; the edible fleshy white coconut meat inside this skin; and the clear coconut "milk" at the center. Coconuts sold in the U.S. almost always have the outer two layers removed. 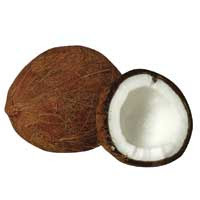 Raw coconut meat (80g) has 283 calories and 27g of fat, mostly saturated. However, some research shows that the saturated fats in coconut may not be nearly as harmful as those derived from animal products. Coconuts also provide an excellent source of manganese and fiber as well as a good source of copper, iron and selenium. The name Coconut actually comes from the Portuguese name Coco, meaning as much as ghost or witch. The outer hairy shell reminded them of this ghostly figure and the word 'nut' was added by the English, after this fruit was introduced in England. Coconut meat does not contain as much sugar than other fruits like bananas, apples and oranges, but more protein. It is relatively high in minerals such as iron, phosphorus and zinc. Coconut water has a slightly sweet taste and is highly nutritious. It is often used in sport drinks and The roots are used as a dye, a mouthwash and are a good medicine for dysentery. Young coconuts apparently seem to have other medicinal qualities which are good for heart, liver and kidney disorders. Coconut can be used in many recipes and will give more flavor to a dish. Recipes can easily be found online. Maybe I will find one to make my own coconut shrimp. Even though they did not have my favorite dish this time, they may have it next time and it is a good excuse to go back. Grin. I have one little sip one time and recall it being very tasty.